So let’s talk. There’s been a lot of conversation around the web — and on this site — about possible alternatives for Evernote. Springpad was the goto app for many, though the most recent update has pulled them further away from that comparison, and drawn the ire of many users in the process. If you look at Springpad, though, as well as several other apps that offer services that are considered comparable to Evernote (Shelfster, Thinkery, OneNote and Catch, for example), you can define a general criteria for a note taking application that I think — no matter how odd it may sound — could also be met by Google’s latest cloud offering and the new face of Google Docs: Google Drive. Stick with me. I’d love to have a conversation with you all about this. First: What is Google Drive? Google Drive is the latest cloud drive offering to hit the web jungle. It came out just this past week and has already been cited as a direct threat to Dropbox, Skydrive, Box, and all the rest. On the flip-side, it’s also received the standard Ahhhhh, Their Stealing My Private Information!!!!! treatment by the web media, as well — in this case, somewhat unfairly (more below). Once you start using drive, you can say goodbye to the docs.google.com url. Your docs shall forever become a part of Google Drive. You’ll still be able to revert to the old Google Docs interface, for a limited time, but the default new dashboard is where you will start, and eventually end up. Storage is low cost and in abundance. And it can take crazy large files, and allows you to view files most other services don’t. Sync with your computers and mobile devices (iOS coming soon) in the same manner as Dropbox. Any of you starting to see why I couldn’t help but compare it to Evernote? More on that, below. At first glance, this is freaky — but the reality is that this is used so that Google can integrate Drive with its other services — for you, of course — and to provide the other functions of the service, such as OCR and image recognition. Of course, this also means they can use the content to better provide you with more accurate advertising, but this is something they do with their services already. Bear in mind that they can also be compelled to give up your information to government bodies or law enforcement agencies if required to by law. This is a standard thing that applies to every online service that houses its servers in the United States. All of these things can be found in similar fashion in the Dropbox terms of service — and even the Evernote terms of service, though some may find Google to be a bit more ambiguous. Personally, I find the Amazon Cloud Drive terms of service much more frightening. What does this all mean? Only this: Google’s scary privacy points are, in this instance, not so different than any other online drive’s terms of service. Does this mean there aren’t potentially frightening possibilities; that it’s all really candy and roses? No. Not unless you consider that the candy and roses could be laced with Rohypnol, that is. But these privacy issues are simply the risk you take when you put your files and personal information online. That doesn’t mean that you shouldn’t be concerned, just that you need to make the same decision, no matter what cloud service you use. NOTE: You can create desktop shortcuts to open new Google Docs files, and then add custom hotkeys to those shortcuts to easily open new “notes”. The same urls used for the shortcuts can be used to create a dropdown in your browser’s bookmarks bar, although one bookmark, loaded in the browser sidebar is a great option for Firefox. The URLs you need are in this Google Document: http://bit.ly/IIiHAo. I’ve also added the shortcuts I decided to use, while testing. If there’s interest, I’ll do a full how-to on this. NOTE: You can also add Google Drive to the Windows Send To context menu by typing %APPDATA%/Microsoft/Windows/SendTo to a Windows Explorer window – press enter. Then open another Explorer window, create a shortcut of your Google Drive, then drag it to the Send To folder you just opened. 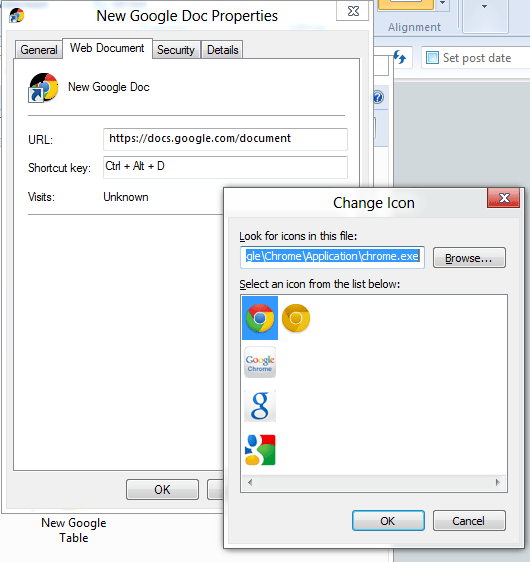 Now, when you right click on a file, you will be able to send it right to your Google Drive (this is based on the Windows 7 OS and also works for Skydrive and Dropbox). Google Drive allows you access to a full office suite, from full document and spreadsheet creation to presentations. It will also allow you to handle files more easily, as well as have real-time, collaborative conversations within the files/notes themselves. For people who want to have a powerful suite that they can leverage in nearly the same way as Evernote, then Google Drive could be a very good option. The same goes for people who don’t like the new Springpad, but find that Evernote just isn’t enough for them. The lack of speedy clipping is an issue for me. This can be overcome with some simple copy and paste, or with extensions like Send to Google Docs (turns a whole web page into a PDF and sends it to Google Docs), and will likely no longer be an issue once some enterprising person or business creates an app for just that, but for the moment it is a bit of an annoyance. Not a deal breaker, though. The other thing is that it is just not as straightforward as Evernote. The workarounds I put together make it easier to get going, but I find that the keyboard shortcuts I created sometimes fail until I remake them in the shortcut’s properties. And as I’ve mentioned in posts before, Evernote is really good at the simple things it does: taking and organizing notes. Once you add all the extra power and options of Google Drive, then you run into the potential of it becoming unwieldy, unless you manage it really well. So there it is, my curiosity and thought process laid out before you. Your turn now! I want to know what you think — feasibility, practicality of application, pure ridiculousness, et al. Let’s chat about it and see what we can come up with as a group! With all of the information, files and, well… stuff we have stored online, it can be a bit complicated to sift through it all when you need to go back and find something. 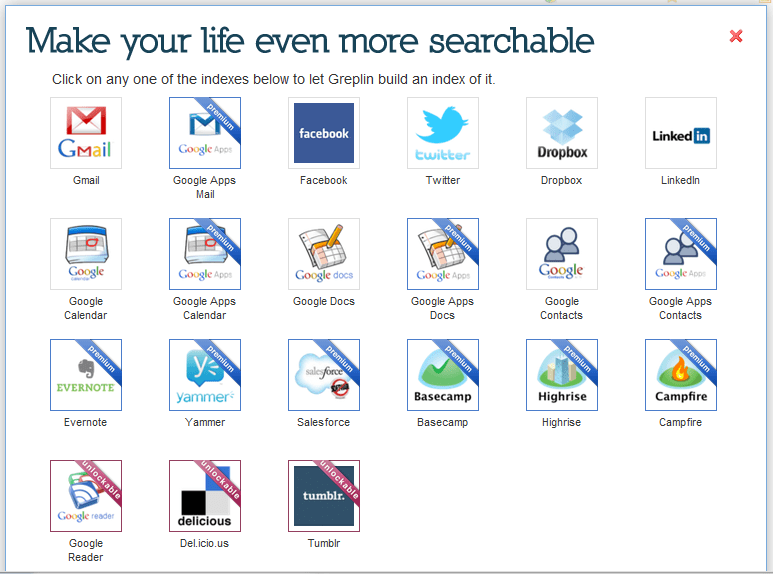 Greplin makes that sort of search a whole lot easier. It indexes several of your online accounts, not the least of which are Facebook, Dropbox, and Gmail, and works like your own personal Google. Greplin has been around since the latter part of 2010, and entered public beta in February of this year. Since then, they have been adding more and more services, and have even developed a Chrome extension that plugs them right into your Gmail — for a search experience that is arguably better than Google’s built in functionality. Greplin is free to use for the most part, indexing up to 10GB worth of data from services like Twitter, Gmail, and other personal Google services like Gcal, Docs and Contacts, as well as Facebook, LinkedIn, and Dropbox. If you want to index accounts like Evernote, Google Apps, and business-related services like Basecamp and Salesforce, however, you will need a premium subscription — which is only $4.99 per month ($49.99/year). There are also a few services that are unlockable via recommendations to friends, such as Tumblr, Google Reader, and Del.icio.us. If you have a need to search through your online files and life in general, it doesn’t get better than Greplin. The interface is fantastic, the instant search feature saves time, and it actually performs better and faster than Google even in the search giant’s own services. The Chrome extension is a nice touch, as well, as it also plugs into the Omnibar, allowing you to search your data by simply typing the letter g, followed by a space and your search term. Want to help me unlock the unlockables? 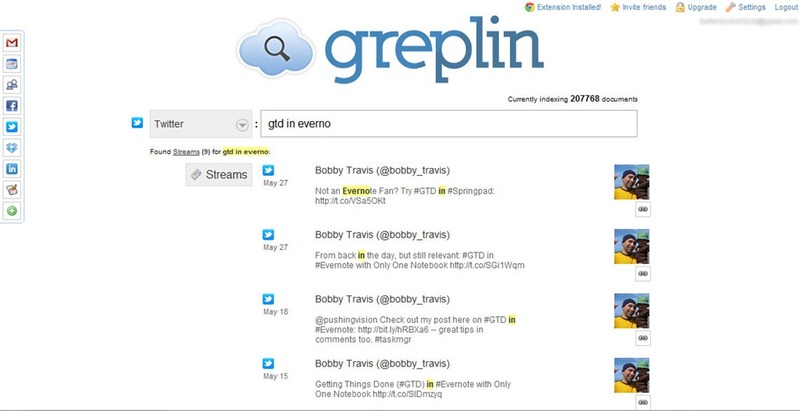 Get Greplin via this link. What do you think of Greplin? There are several ways to sync Microsoft Office documents to the cloud (we covered three here), but until now, not one of them was made by Google. Whether that statement sparks feelings of warm and fuzzy quality in you, or makes you shudder in fear as Google officially digs its fingers into your Office docs, Google Cloud Connect has taken off the training wheels and been released to the world at large. Besides, if you are of the latter persuasion, chances are you haven’t bothered with the Google account that the service requires. Giving MS Office the online capabilities of Google Docs — and this is a good thing, as Microsoft’s cut-down web offering of Office can be somewhat unwieldy by comparison. Finally gives Google Docs the offline capability it has always needed to make it truly relevant in today’s workplace, which is still a few years away from going fully to the cloud. Google Cloud Connect works on Windows XP, Vista, and Windows 7, and is available for Office 2003, 2007, and 2010. Check out the video below for more information on its capabilities. 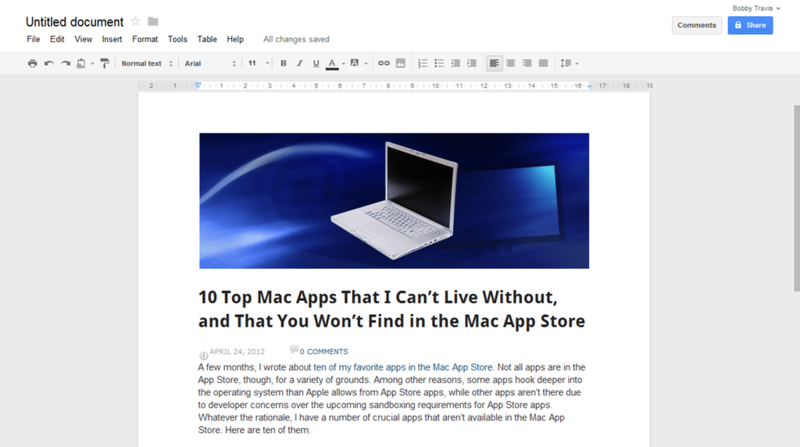 While Evernote is great if you take lots of notes that you want to save, it can be a bit cumbersome for quick notes. Dropbox is great, too, but doesn’t allow for quick editing of files unless you’re on a computer that has Dropbox installed. If you are a frequent user of Windows’ native Notepad app, and want to have your notes accessible on any computer, check out Nocs. Nocs looks much like Windows’ Notepad app, but with the option to save your text files to Google Docs. When you first start Nocs, you need to input your Google credentials. Then, when you save a text document, you can choose to save it locally, or to your Google Docs account. When you save to your Google Account, you can designate a folder into which you can place your document. In the future, when you want to load your document, you choose the “Browse Google Docs” option in the File menu. From there, you’re presented with a list of your Google Docs folders on the left of the popup screen, and the documents within each folder on the right. Nocs loads fast, and also autosaves in the background (if you enable that feature in the preferences). It also supports multiple tabs. The best part? It is free. Nocs is Windows only.